I’m not going to suggest that this mystery will be difficult to solve, last time I did that I got “egg on my face”! 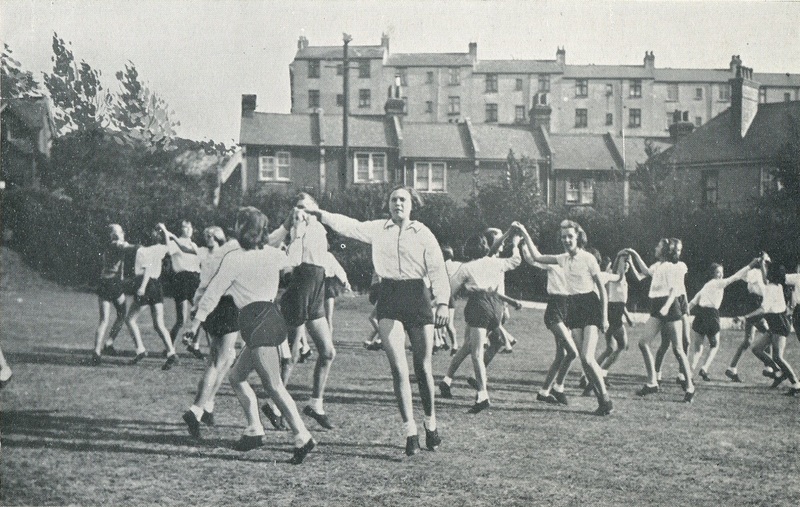 The photo is taken from my 1939 Education Week booklet and shows the seniors folk dancing on a playing field; probably a school playing field? The houses in the background may give some clue in the way they tower above those closer. Either they are high on a hill or perhaps unusual four story houses. Before Janet Beal or anyone else asks, I have no idea where it is, thats down to you mybrightonhovers! Hi Janet. I suspect the girls are actually dancing in the grounds of Balfour School, since the house on the right, at the angle, is still there on the corner of Loder Road and Balfour Road, backing on to this area of field. The gap to the left of the last house pictured in Balfour Road, No 38, is now occupied by Nos 40 and 40A. Between 38 and 40 runs a good old Sussex twitten, all the way up to Osborne Road.The last house pictured here in Osborne Road, the end-terrace, is almost certainly No 113, where the twitten now emerges. After this photo was taken, further houses were built right up to Ditchling Road. Regards, Alan. You could very well be right, Alan. I thought the same myself. The girls look too old to be primary school age, but I couldn’t understand why they would be dancing in the grounds of Balfour School. Perhaps the boundary has changed over the years?